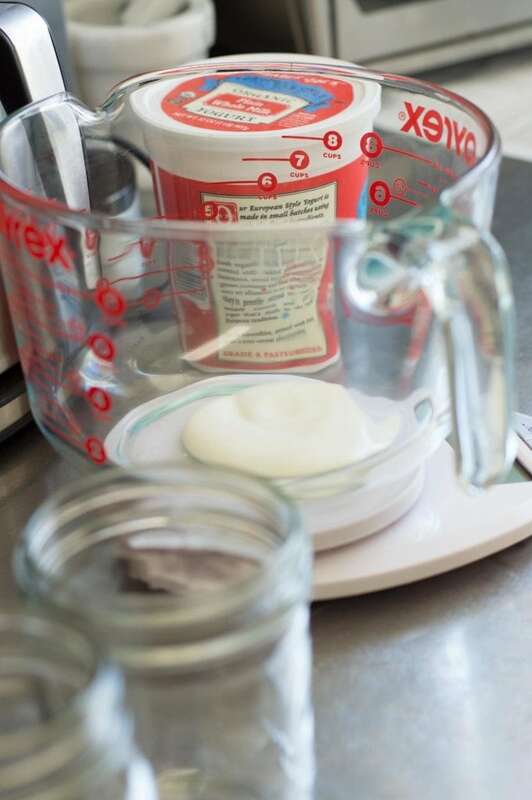 Have you always wanted to make yogurt at home, but you’ve been intimidated by the process? Fear no more! Here, I’ll explain everything you need to know about making yogurt. Whether you’d rather read the long explanation or skip to the simple recipe, I’ve got you covered. The internet is not wanting for yogurt recipes. You can make it in a variety of contraptions, from insulated coolers to dedicated yogurt-making machines. Here, I’ve used two kitchen tools that are multi-purpose and indispensible in my kitchen: a folding bread proofer and an instant read thermometer. First, I’ll outline the process with lots of detail, explaining each step as I go. If you’re more interested in the how than the why, just jump down to the bottom of this post for a streamlined recipe. You can do this in the microwave or on the stovetop. I prefer the stovetop, since it allows for more hands-on control, but you also have to be careful that you don’t scald the milk by a.) turning the stove on too high or b.) neglecting to stir the milk often. Heat your milk over a medium-low to medium flame, stir often, and you’ll be sure to get a good result. When the milk comes up to temperature, it will be foamy on the surface, but not simmering or boiling. 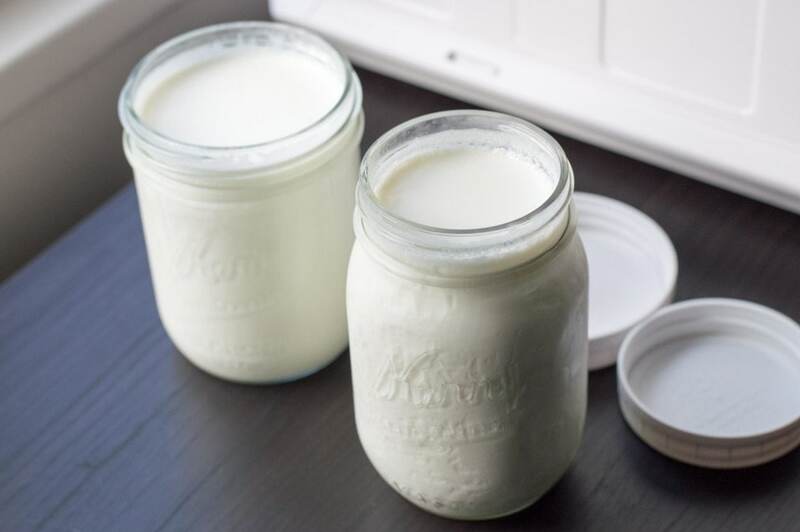 If you’ve accidentally boiled the milk, remove it from the heat until it comes back down to 195ºF/90º or lower, depending on the style of yogurt you’re making. Rest assured that boiling the milk will not ruin your yogurt – the experts at Brød & Taylor explain that boiled milk won’t coagulate (i.e. clump up and make your yogurt lumpy) unless you’ve added acid. Boiling will likely result in a thicker yogurt, however, with a more “cooked” taste. SPLASH-PROOF SUPER-FAST ® Instant-read thermometer. Sample provided by THERMAPEN ®. You’ll need to use a thermometer to monitor the heat of the milk during this step. Whether you’ve got a candy thermometer that perches on the edge of your saucepan, or the hand-held, instant-read variety, either will work well for making homemade yogurt. I prefer the hand-held type, since they’re much more versatile. I use my snazzy little Thermapen for yogurt-making, and also for candy, baked goods, fish, meat, and poultry . . . the list goes on. Invest in one of these, and you’ll be set for all of your food temperature-taking needs. 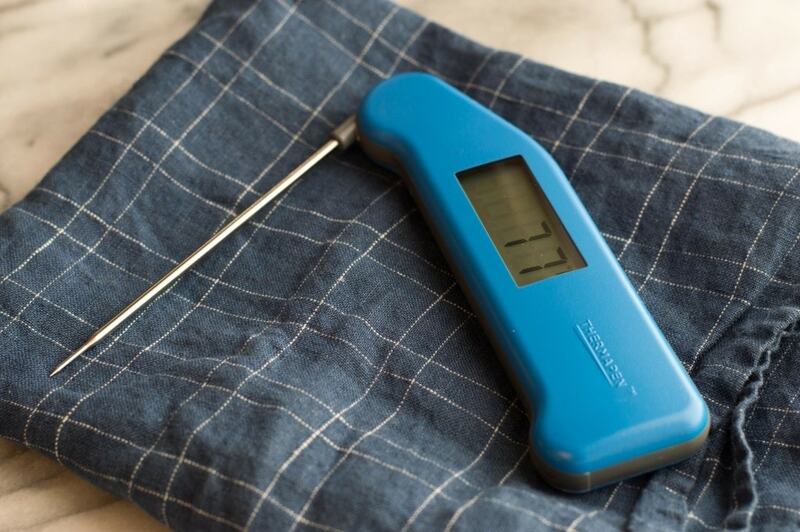 You can read more about the advantages of Thermapen thermometers at their website (blazing fast readings! long battery life! ridiculously huge temperature range! ), where they retail for $96. They also sell a much less expensive (and slightly slower) ThermoPop for $24. Both models come in a rainbow of great colors, and will become invaluable in your kitchen. 2. Holding the milk at temperature. This is a step often left out of yogurt recipes, but it makes a big difference in ensuring the texture of your final yogurt will be thick and custard-like. Not only does a brief stint at high temperature allow the milk to evaporate a bit, it also helps the proteins denature completely, which will allow the bacterial culture to work more effectively to bind them into a stable matrix. Keeping the milk at temperature (165ºF/74ºC for a pourable, European-style yogurt, 195ºF/90ºC for a thicker, custard-style) for ten minutes requires a bit of patience and concentration, since you’ll be raising and lowering the heat of your burner to keep the temperature up to 195ºF/90ºC, but not over. Continue to stir during this step, as it’ll help to keep the milk from sticking and browning on the bottom of the pan. This part’s easy. Take the pot off the stove and allow the milk to cool. To speed things up, I like to place a shallow pan of cold tap water in the sink (a 10-inch cake pan works great for this), then place the pot of milk in the pan, being sure not to splash any water into the milk. Stirred every so often, the milk will cool to 115ºF/46ºC /46ºC in about 15-20 minutes. If you like, you can speed up the process further by refreshing the water bath halfway through the cooling process, or by adding ice cubes to the water bath. Just be sure to monitor the temperature often, as you don’t want it to dip below the ideal range for thermophilic cultures to do their job, 110-115ºF/46ºC . 4. Adding in the yogurt culture. Once your milk is cool, pour a cup of it into a bowl. I like to use a 2-quart Pyrex measuring cup for this step, since its handle and spout will make it much easier to pour the yogurt into containers later. To the milk in the bowl, add two tablespoons of cultured yogurt, whisking gently until fully incorporated. 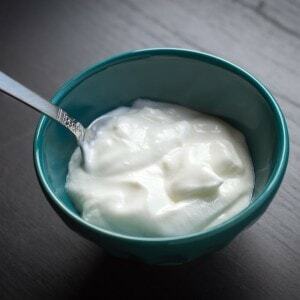 It’s best if your yogurt is at room temperature, and it should be a plain variety that contains live active cultures. Finally, whisk in the remaining milk, then pour the mixture into two pint-sized Mason jars. This step is the one that is, perhaps, the most intimidating for a home cook. You’ve got to keep the milk nice and warm as it cultures over a period of anywhere from three to ten hours. The length of time required to culture a batch of yogurt relies on many variables, including the strength of your culture, the protein content of your milk, the insulating properties of your culturing container, how tart you prefer your yogurt, whether the yogurt gods are smiling on you that day, etc. You can gauge whether the yogurt has set by jiggling one of the jars — if the milk has firmed up and looks like it has set, the yogurt is ready. A dedicated yogurt maker certainly simplifies this step, but I’d rather not have a unitasker in my kitchen if I can help it. Furthermore, this device limits you to using the small, individual serving size jars included with the unit. Sandor Katz’ method uses an insulated cooler, heated with warm water before the culturing process begins. However, frequently checking the progress of your yogurt can cause the temperature in the cooler to dip, requiring the addition of hot water bottles to keep things toasty. The best solution I’ve found so far is a contraption that’s valuable for so much more than making yogurt. 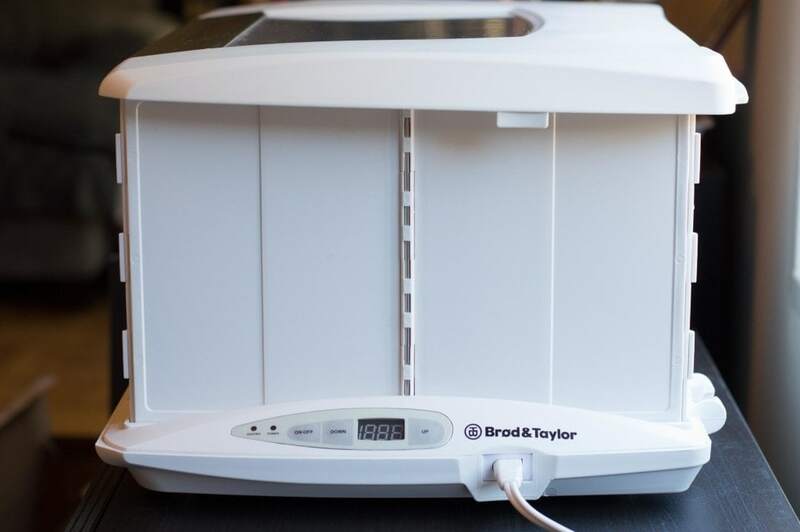 Brød & Taylor’s Folding Bread Proofer & Yogurt Maker is basically a big box with a heating element and a temperature gauge. It’ll keep whatever you’ve placed inside it at a temperature of 70-120ºF (21-49ºC), so it’s perfect for allowing bread to rise, culturing yogurt, butter, and cheese, tempering chocolate, softening butter or cream cheese for baking . . . its gentle, steady heat has so many applications, and its generous size allows you to place containers of many sizes and shapes within its walls. When you’re ready to put it away, the proofer collapses down to 18 by 14.5 by 2.8 inches, and can be stored on its side. Once your yogurt is cultured, screw lids onto the jars and place them in the refrigerator to chill before serving. You can use the bands and lids that come with most Mason jars, but I prefer the single-piece, plastic variety. You can find them online, and they’re sold in most hardware stores, and in the canning section of most grocery store during canning season. Refrigeration slows down the culturing process considerably, not killing the bacteria entirely but causing them to metabolize much more slowly. Your finished yogurt will keep for about two weeks, increasing in tartness as time goes on. If you’d like to add fruit or honey, do so just before serving. Hi there! Are you still with me? Congratulations! You are now a yogurt-making expert. It’s time to make a batch of your own. 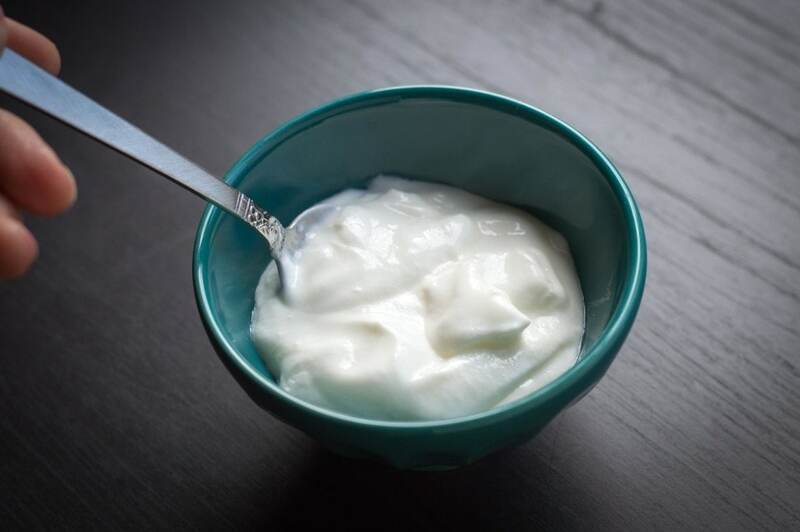 A simple guide to making your own yogurt at home. 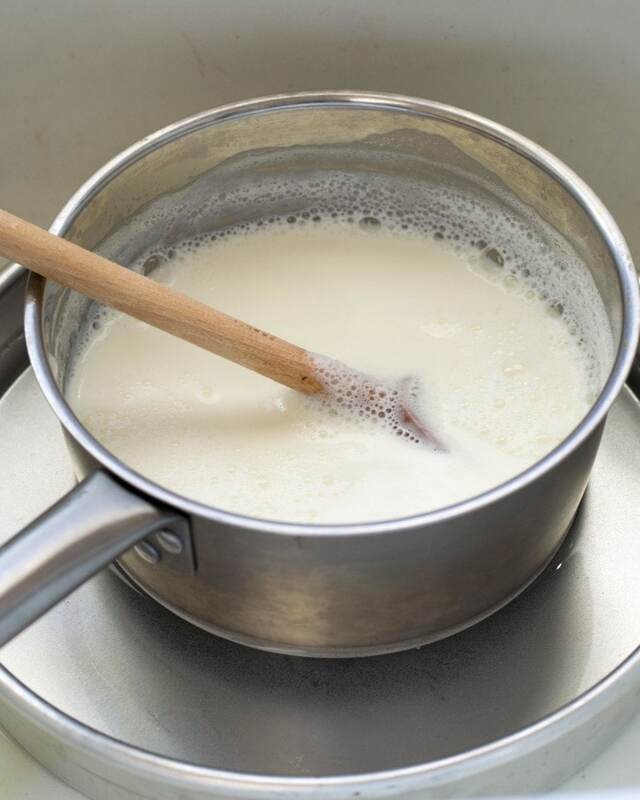 Heat the milk in a medium (2-quart) saucepan over medium heat, stirring often with a wooden spoon. Monitor the temperature of the milk with an instant-read thermometer until it reaches the desired temperature. For pourable, European-style yogurt, heat to 165ºF/74ºC. For custard style yogurt, heat to 195ºF/90ºC. Hold the milk at the desired temperature for 10 minutes. 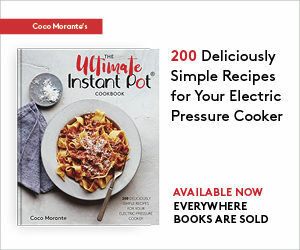 In order to do this, immediately turn the burner down to the lowest heat setting, and stir often, checking the temperature frequently and raising/lowering the heat as needed. When the ten minutes are up, remove the saucepan from the heat. Place a 10-inch baking pan in the sink, and fill with cold tap water. If you want to reduce the cooling time considerably, add two cups of ice cubes to the water. Gently place the saucepan into the baking pan full of tap water, taking care not to splash any water into the milk. Let cool to 115ºF/46ºC, stirring occasionally to hasten the cooling process. Without ice cubes, this will take about 20 minutes; with ice cubes, the milk will cool much more quickly, in about five minutes. While the milk is cooling, set the folding bread proofer to 120ºF/49ºC. Pour 1 cup of the milk into a 2-quart glass measuring bowl, and add the live, active yogurt. Whisk gently and slowly to combine the yogurt and milk thoroughly, without creating excess froth. Add the remaining milk to the measuring bowl and whisk gently until thoroughly mixed. Pour the milk/yogurt mixture into two pint-sized Mason jars. Place in the folding bread proofer. After one hour, lower the temperature to 86ºF/30ºC. After two more hours, begin to check the yogurt for doneness. You can do this by tilting a jar of yogurt to see if it has set up. If you do not have a folding bread proofer, you can use an insulated cooler, heated with warm water and kept at temperature with hot water bottles. Screw the lids onto the jars of yogurt and place in the refrigerator, chilling completely before serving. Store for up to two weeks. 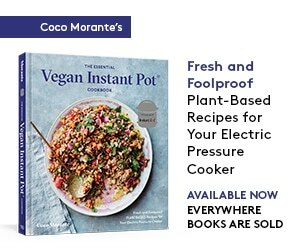 I just got an instant pot and I love your cookbook! I’m hoping to make mild tasting yogurt in my IP. You wrote that the yogurt will start to set after cooking for 3 hours but your recipe calls for cooking 8 hours.. If I want mild tasting yogurt, should I just reduce the cooking time? Thanks!